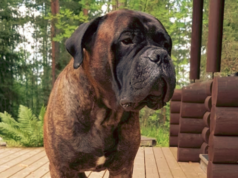 Home Bullmastiff dog diseases Do Bullmastiff Drool A Lot? Bullmastiff is one of the most popular pets. It is well known for its amazing characteristics. Bullmastiff is a hybrid dog which was originated by the cross-breeding of two popular dog breeds. These dog breeds were Mastiff dog and Bulldog. If you are about to purchase a Bullmastiff then it is necessary to know about it. As we know that Bullmastiff drools but do Bullmastiff drool a lot? Let’s figure out this in this guide. What is Drooling in Bullmastiff Dogs? You cannot get rid of drooling until you know what drooling is. Hence, it is necessary to know what is drooling in Bullmastiff dogs. Drooling is basically the frequent expel of water or saliva from the mouth. They often drool on smelling food. Likewise, their drooling can be observed after taking meal and drink. Besides, Bullmastiff dog also drools in stressed conditions. Bullmastiff dog is giant dogs which are courageous, brave and protective in nature. These guard dogs can survive for a duration of about 8 to 10 years. Bullmastiff can be found in three adorable coat colors which are fawn, red and brindle. When it comes to drooling, there are several reasons of drooling in Bullmastiff dog. The drooling can be an underlying cause of a disease. Most often, it is the dental problems that lead to drooling in Bullmastiff dog. A disease that obstructs the Bullmastiff from swallowing the saliva can be a cause of drooling. Ensure to prevent dental caries. Take your pet to the vet for regular check up. It would lead to early diagnosis of disease and timely treatment too. 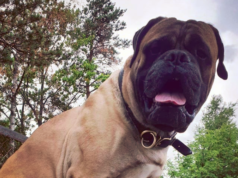 Do Mastiffs drool a lot? Bullmastiff has characteristic of both dog breeds, Bulldog and Mastiff dog. 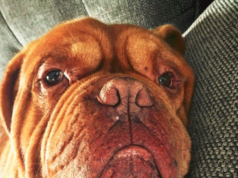 Do Mastiffs drool a lot? Just like Bullmastiff, Mastiff drools a lot. Mastiff dog owners need to learn how to combat with drooling of this dog breed. They can drool a large amount of water. Bullmastiff dog does not merely drool but they are gassy dogs too. They slobber, drool and snore. Mastiff dog is good-natured, protective and affectionate. Their average lifespan is more than the Bullmastiff dog which is 10 to 12 years. After quenching the thirst of knowing Do Bullmastiff drool a lot, it is necessary to know that how can we stop drooling in Bullmastiff dog. You can control drooling of your dog by tucking a towel or absorbent cloth around the neck of the dog. The larger the jowls a Bullmastiff have, the more hypersalivation it would experience. 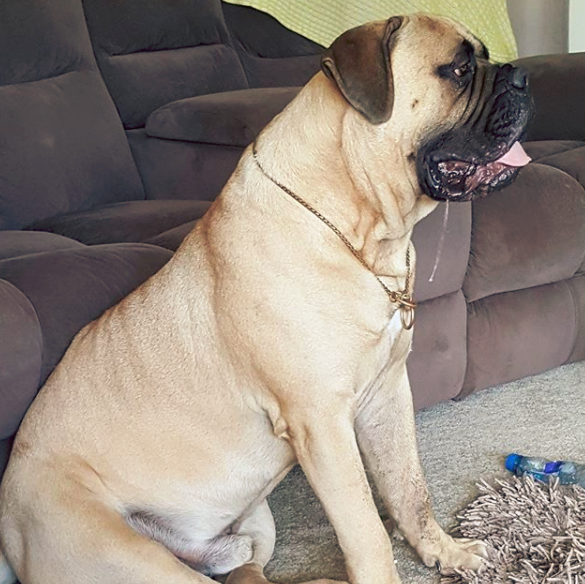 The owners of Bullmastiff dog do not need to worry about the drooling of their pet. They can control the hypersalivation of their beloved pet through medication. Yes, it is possible through the use of medicine. Anticholinergic medicines have the capability to control drooling. It includes scopolamine and glycopyrrolate. The drooling gets diminished through it.